Hello and welcome to Adventures in Profit Rhino: Lord of the Help Articles, this week we'll be going over a few changes that have been to the quote builder. It'll be important to get all your techs up to date on the changes in layout, functions, and other miscellaneous items. 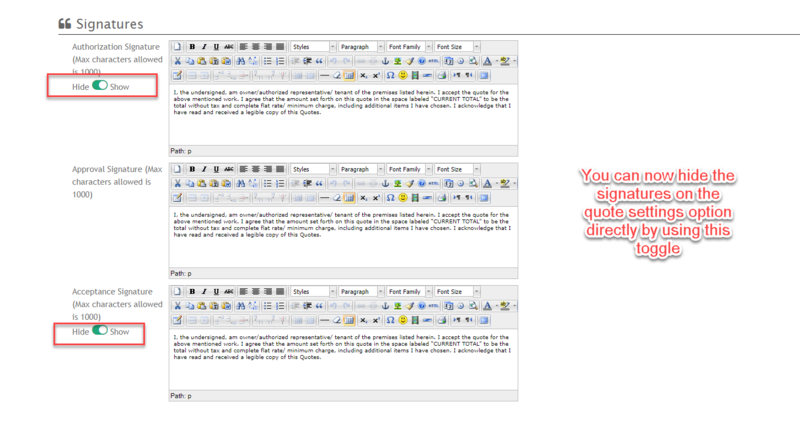 Just a quick recap on what our Quote Builder looked like, here's a peek at it. So, not bad. You've got a bar at the bottom with a couple different options on what you can do with the quote, a spot for customers to sign, a standard rate and a value rate, a box for financing (if you choose to finance), and a box for adding discounts. You should be familiar with the functionalities of all of these if you've completed the on-boarding training, so I'll be moving on to the changes that we've made. First and foremost, we've added two additional signature boxes, (don't worry, if you click them they get bigger. No need for super tiny hand writing.) a Diagnosis Signature box and an Acceptance Signature box. These function as safeguards for scenarios that I'm sure you're all familiar with. You come to check out a problem at a customers house, you diagnose the problem, but the customer refuses to pay and doesn't want anything else done. The Diagnosis Signature will serve as written documentation that they agreed to have you take a look and that they're liable for charges. The Approval Signature indicates that the customer agrees with your evaluation of what needs to be done, and agrees to having you do it. The Acceptance Signature is written documentation that the customer has reviewed your work and is happy with the job that's been done. This will be useful if a customer tries to claim that you did a poor job and wants their money back a month later and etc etc. If for some reason you have no interest in having those additional signatures, or you need to change the language written in the new and old signatures, that's not a problem either. 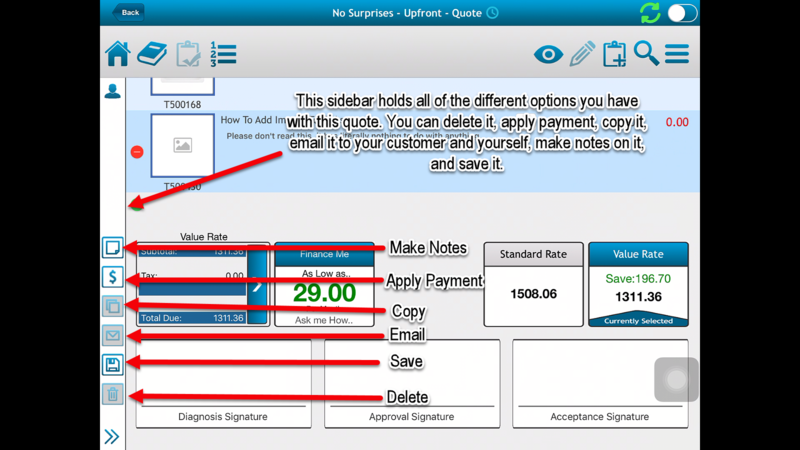 To change the language up in any of your three signatures, simply log into your Profit Rhino office account, click on the Settings tab, and click on the Quote Builder tab, and then scroll down just a bit. You should see all three signatures lined up, with boxes for altering their dialogue. The following image demonstrates. There are of course some people who don't want the hassle of having three different signatures, breaking up their process, or don't see it as all that necessary. That's not a problem. If you'd like to disable two of the signatures, simply go to your office account, click on the Settings tab, click Mobile Settings, and you'll see a few drop down boxes related to two of the signatures. You can click hide, or show, and that'll disable or enable those signatures out in the field. The following image demonstrates. Next, we've got the changes we've made to the sidebar. You'll notice that you no longer have all those options of what you can do with the quote at the bottom, that's because we've created a new sidebar that looks a little bit cleaner. So, pretty simple stuff, you've still got all the options you had before, they no longer clutter up the screen though. The functionalities of these different buttons are pretty self explanatory, and there hasn't been any changes made to them other than their appearance. 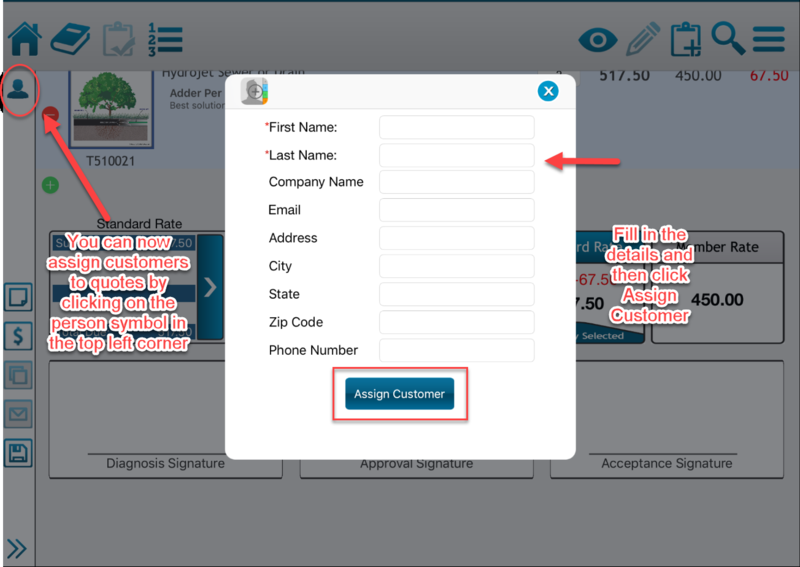 Additionally, there's been an update to how you'll assign customers to a quote. 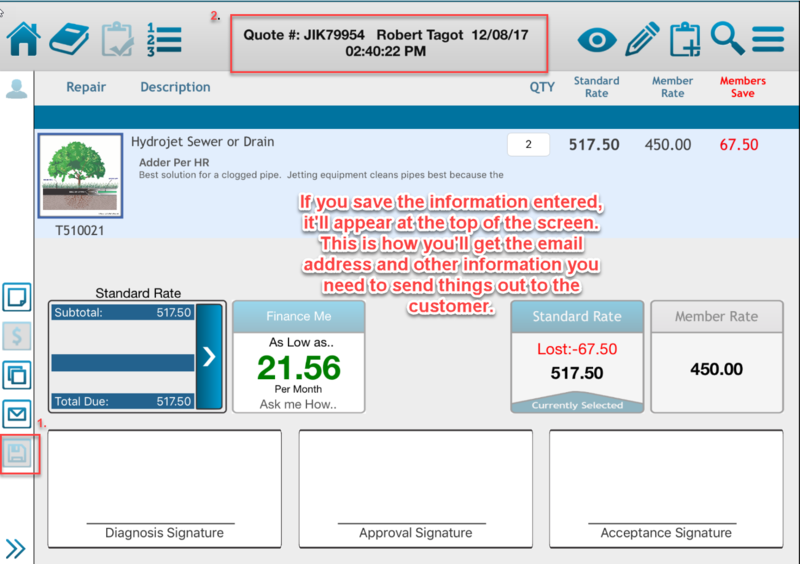 Previously, after you'd finished a quote and you selected save, you'd get a popup box asking you to enter customer information. Now, you can enter customer information at any time. The following images will demonstrate. 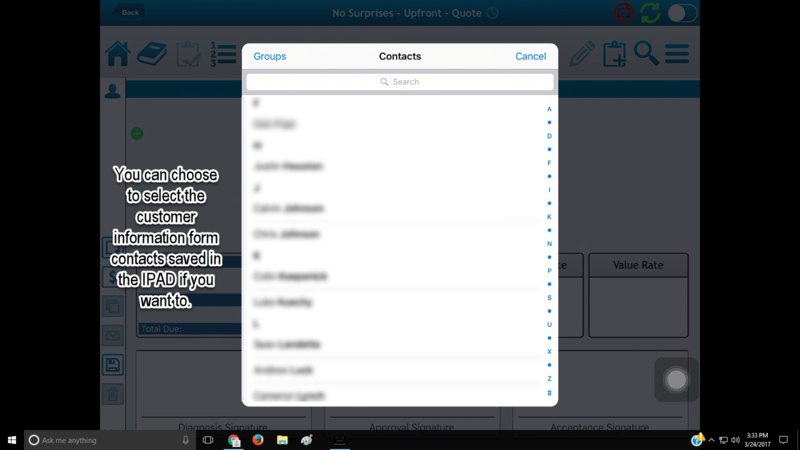 You can also assign customers from your IPAD contacts by simply clicking on person image in the pop-up box that appears. 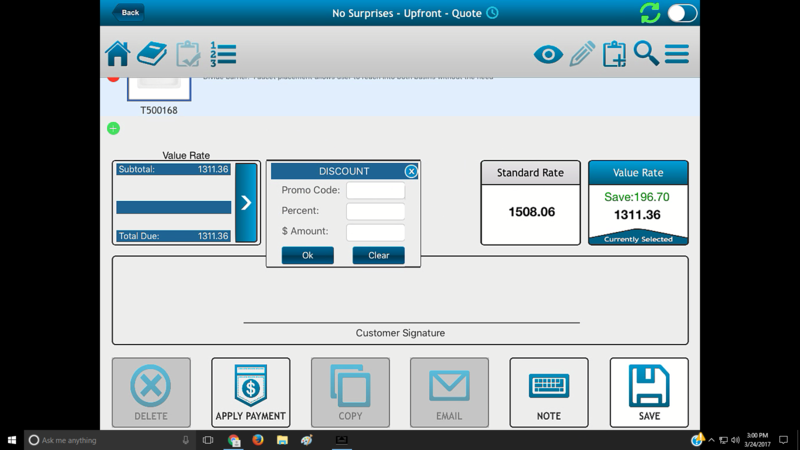 Then, after filling out the information or selecting a customer you can choose to save or save & email simultaneously. 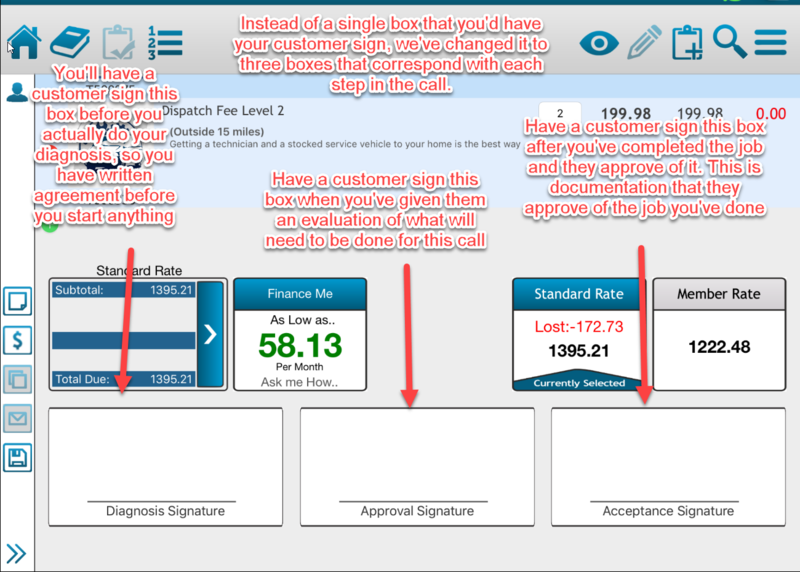 The image below demonstrates what the screen should look like after you've saved a customer. So, that's all the changes made to the sidebar, but you may have also noted that we've made a few changes to the totaling options. In older iterations, if you hit the arrow next to the price, you'd only get discount options (promo code, percent, and & amount). 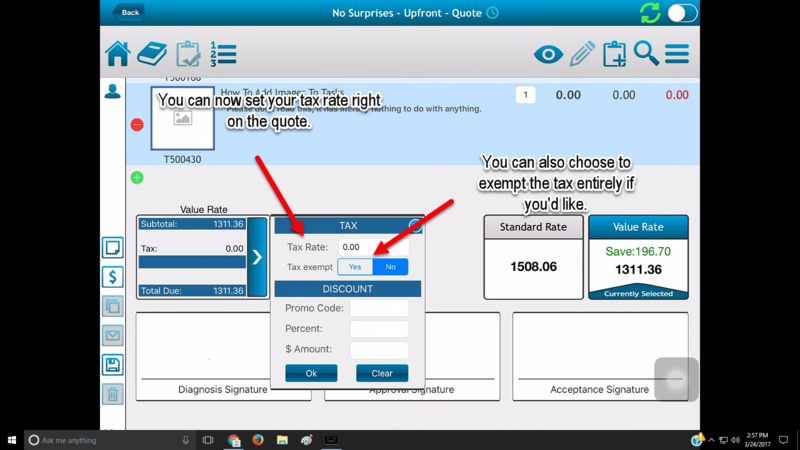 Now, if you click it, you can choose to change the tax rate or make a customer tax exempt. The following image illustrates. Not a super complex change, but I'm sure your techs will appreciate the flexibility out in the field. Most of these changes consist of changes in layout more than anything else, but we here at Profit Rhino feel that technicians out on the field want to he able to have clear and concise quotes presented to their customer, want these additional signatures to protect the company and themselves, and enjoy the extra flexibility these changes offer. NOTE: All images shown are from an IOS system, but the functionalities are the same in Android systems as well.